Meat and potatoes just go so well together. But, many variations of potato dishes are ones that are boiled or fried or baked. Some just don't translate well to grill preparation. My husband was making a roast on the grill recently and I thought baked potatoes would go well with it. But, I didn't want to wait or the oven to preheat and then an hour to bake them or for them to bake on the grill. So, I washed them, poked them with a fork and put them in the microwave for about 8 minutes. 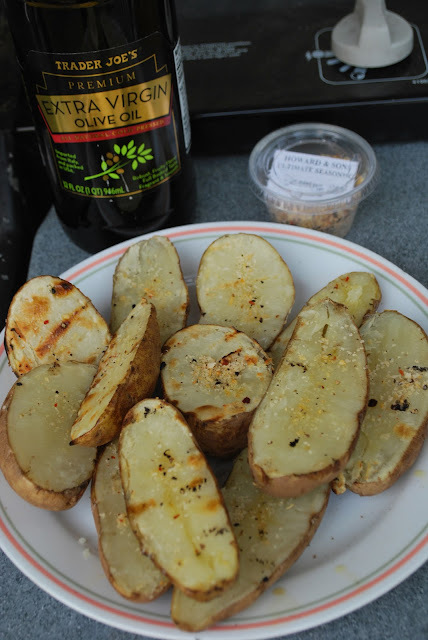 When they came out, I sliced each in half then took them out to the grill, where I brushed them with olive oil and sprinkled them with seasoning. We have a meat market nearby called Howard's Meats and they make their own "Ultimate Seasoning" that I like to use on everything and it's great for potatoes. So, after they were brushed and sprinkled, they went on the grill for a few minutes, which was just enough to get a lightly crunchy coating. It was perfect and took a fraction of the time it would have to make traditional baked potatoes in the oven or on the grill.